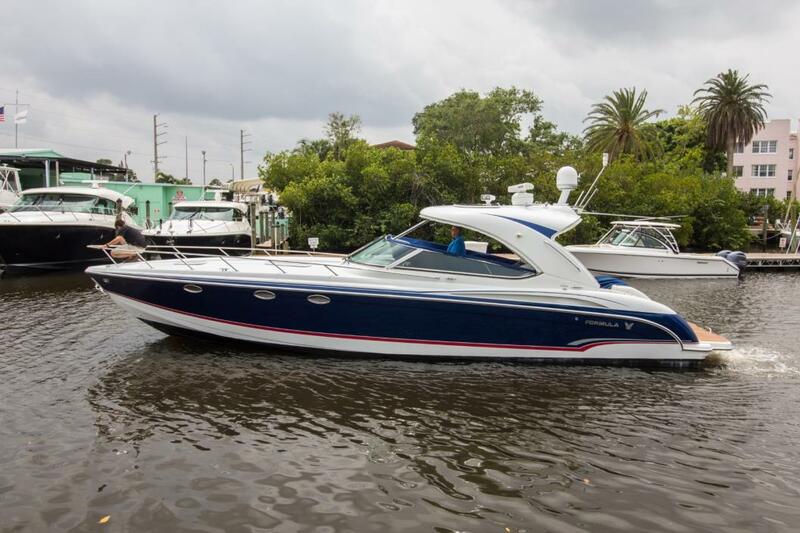 2009 Formula 400 Super Sport If you are in the market for a 40' High Performance Boat with loads of creature comforts, look no further than this beautiful 400SS Formula 2009! 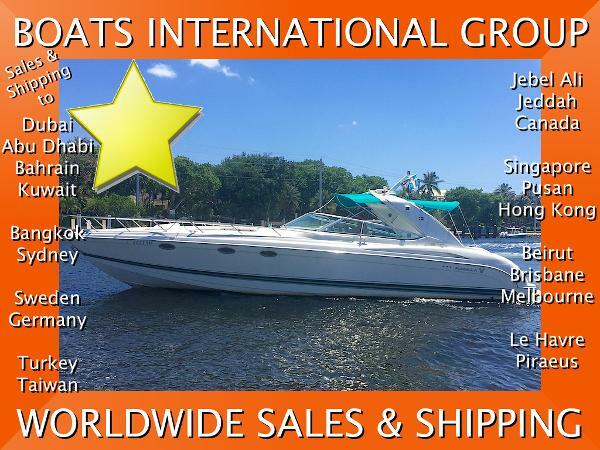 New price reduction to $239,900 4/17 Fresh Bottom and Outdrive Paint All systems recently serviced Mercury 525hp EFI Racing Motors Bow Thruster Sat. TV Air Conditioner Generator Imron Black Hull Raymarine E120 Electronics Raymarine 4kw Radar HD Cockpit Air This is a fully loaded 400SS freshly serviced and ready for her new owner! Call today for details. 2007 Formula 400 Super Sport The 400 SS with twin DIESELS has redefined the high performance express cruiser, and its famous FASTECH hull, customized for the 400 SS, boasts a stable, dry ride with agility of a true performer and top speed of 54 plus mph provides captain and crew an exciting ride. 1999 Formula 400 Super Sport This beautiful 40 Cruiser earned the Boating Magazines, BOAT OF THE YEAR , award when released in 1998. Deigned to push the limits of luxury and performance, it boast features like plush cockpit seating for 12, a 14 speaker JL Audio sound system, cockpit wet bar and a well laid out cabin with full galley that sleeps four. The Formula 40 SS has a double stepped hull and twin 502 Mercruisers at its core, giving it plenty of power when you want it. Features like the walk through glass to the bow, enclosed powered windlass and the hot and cold transom shower are only a few great items making this yacht stand out above the competition. 2007 Formula 400 Super Sport Full specs soon! 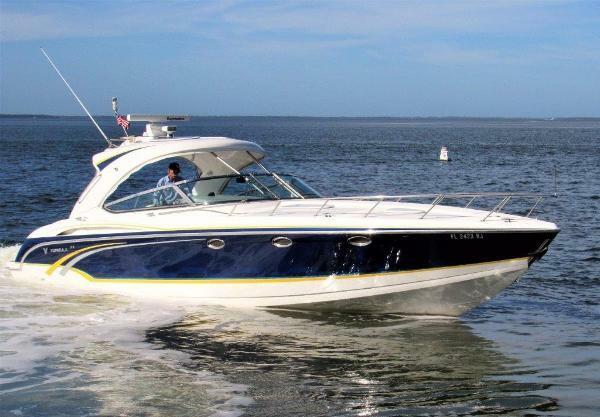 1999 Formula 400 Super Sport The Formula 400 SS is a high performance express that offers good cruising accommodations in a sporty package. Lots of cockpit seating is provided by a U-shaped lounge. The interior features luxurious wraparound seating forward, a large stateroom aft and a head with shower for a good amount of room for a performance-oriented boat. 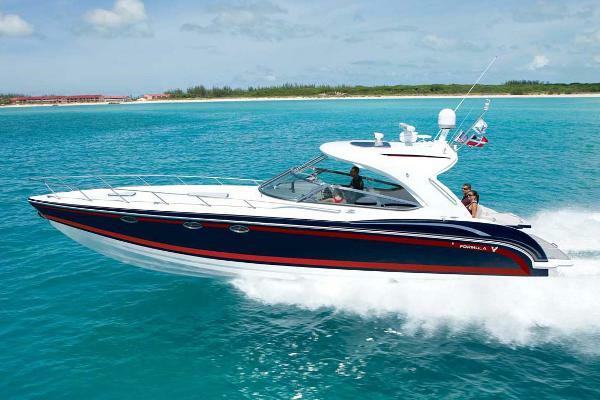 The Formula has a deep vee hull that offers good sea keeping and fast cruising speeds with her twin stern drives. 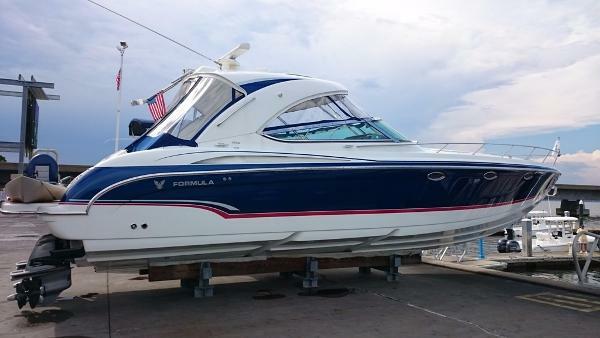 The boat was lift kept up until 1 year ago, owner purchased a new Formula and is motivated to sell. Recently had new bottom paint and gone thru mechanically. 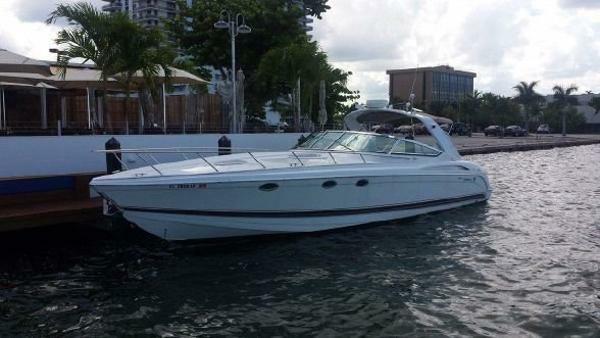 Seller is currently a two boat owner and very motivated - accepting all offers. 2017 Formula 400 Super Sport With striking hull lines and a continental flair, the 400 Super Sport combines exhilarating speed, luxurious comfort and endless storage capacity for both daytime excursions and long-range journeys. Measuring 41 feet six inches in length with an 11 beam, the 400 SS is equipped with the now-famous FAS3TECH hull. Customized for the 400, it boasts a stable, dry ride with the agility of a true performer and top speeds near 60 mph utilizing sterndrive power from this twin 370 hp to twin 525 hp packages. Its 22-degree deadrise reveals its performance heritage. Currently, there are three new Formula 400 Super Sports in stock and available. To view the window stickers for each of these yachts, click the "View Full Specification" tab to download the window stickers, and give us a call for more specific information and discount pricing! * Sistership photos are being provided here - contact us for more information about this specific boat and current location. 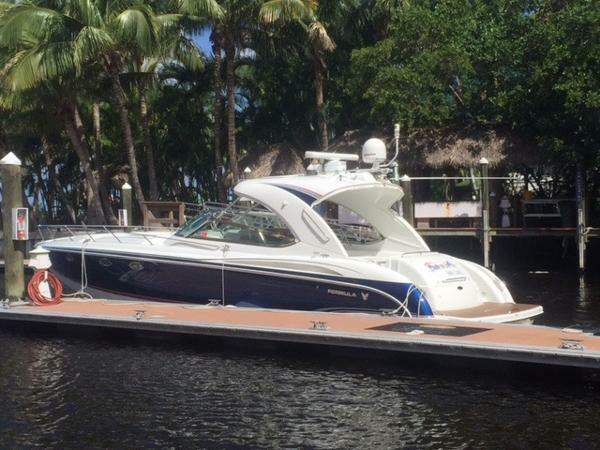 2006 Formula 400 Super Sport This beautiful Formula 400 Super Sport is in mint condition and will bring you to all yourdream destinations. She is ready for the Florida waterways. This baby doesnt need anything but the perfect owner-and thats you! Highlights include: - High Gloss Teak Cabinetry - Corian counter tops- Generator- Expandable Dining Table- Always Stored in Dry Storage - Unique Exterior Paint- Powered by two Super Efficient Turbo Charged Volvo Penta Diesels See Full Specs for Complete InventoryBe Sure To Click On The Video Link Above The Main Photo! 2016 Formula 400 Super Sport With striking hull lines and a continental flair, the 400 Super Sport combines exhilarating speed, luxurious comfort and endless storage capacity for both daytime excursions and long-range journeys. Measuring 41 feet six inches in length with an 11' beam, the 400 SS is equipped with the now-famous FAS3TECH™ hull. Customized for the 400, it boasts a stable, dry ride with the agility of a true performer and top speeds near 60 mph utilizing sterndrive power from this twin 370 hp to twin 525 hp packages. Its 22-degree deadrise reveals its performance heritage. Currently, there are two new Formula 400 Super Sports in stock and available. To view the window stickers for each of these yachts, click the "View Full Specification" tab to download the window stickers, and give us a call for more specific information and discount pricing! * Sistership photos are being provided here - contact us for more information about this specific boat and current location. 1999 Formula 400 Super Sport 1999 FORMULA 400 SUPER SPORT w/ NEWER DRIVES & ENGINES This 50+ MPH Formula 400 Super Sport has newer drives and updated 502 engines. 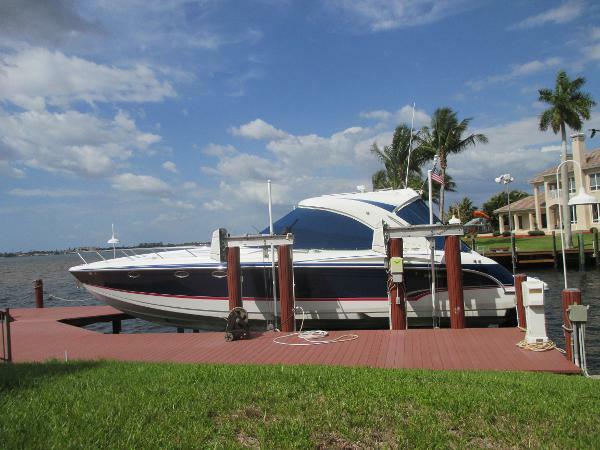 2-owner boat with loads of extras and options including $50,000 IN RECENT UPDATES. This beauty has been dry-stored and lift-kept since new and was just bottom painted last season (as current owner awaits installation of his new boat lift). Last season one of the Bravo III drives was replaced with a Bravo III Seacore and in March of this year the other drive was replaced - also with Bravo III Seacore! Additional updates this year (2016) includes new exhaust manifolds and complete tune-up, brand new bottom paint, and more. 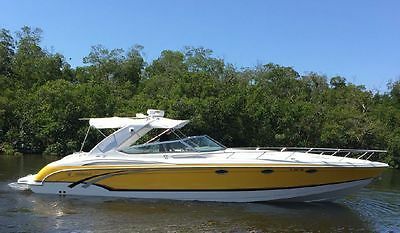 2007 Formula 400 Super Sport 2007 Formula 400SS powered by the preferred twin Volvo Diesel D6 350's providing power , performance and economy! Stored inside this is a fine example of this classic express cruiser. Finished in IMRON midnight Blue metallic with red boot stripe. Raymarine electronics, E120 and E80, Raymarine Autopliot, Open array radar, Sirius weather, Westerbeake Generator and Bow thruster. Interior is the Ralph Lauren finished with deep Cherry cabinet work. Chamios UltraLeather sofa's and seating, Corian finish is Morocco and cabin floors are wood grain finish. The exterior options include the hardtop, full canvas in Sapphire Blue, 'Teek' Teak swim platform and icemaker. 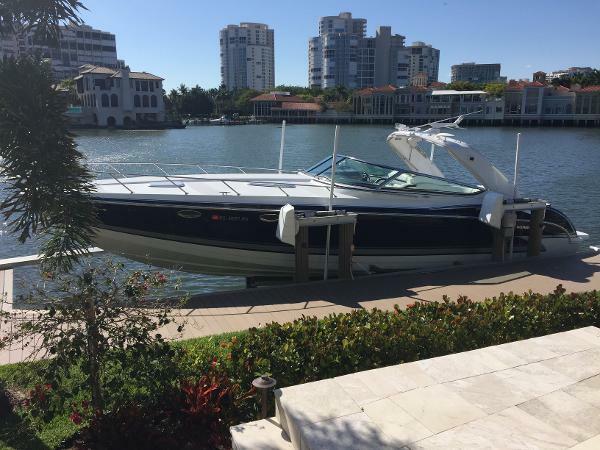 2007 Formula 400 Super Sport (LOCATION: Coral Gables FL) The Formula 400 Super Sport is a full-featured cruiser with exceptional style, luxurious accommodations, and outstanding performance. 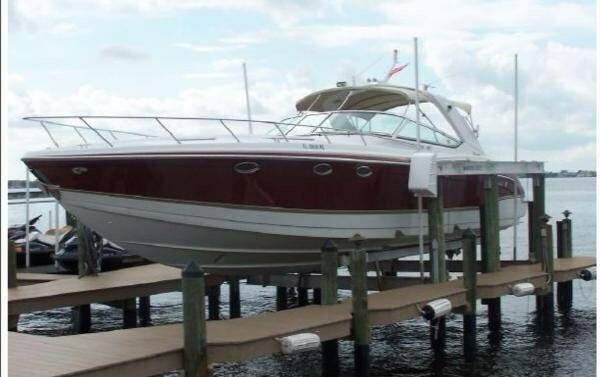 This "like new" Formula has been well maintained and upgraded by a meticulous owner. She features a large cockpit with ample seating and a spacious upscale interior. 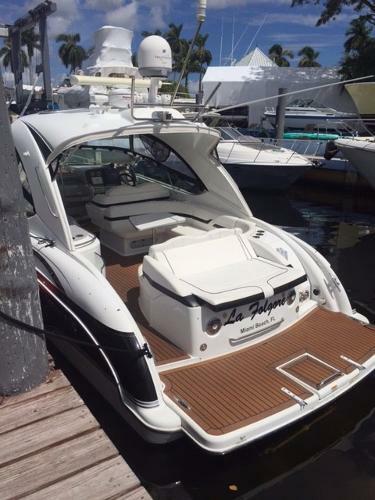 Whether you are planning a day on water or a weekend getaway this 40' express is ready to accommodate.On deck we have a large air conditioned cockpit with hardtop and Eisenglass enclosure. Seating includes a double-wide helm seat with flip-up bolsters, port side companion lounge, and wraparound cockpit lounge with removable table. A port side wet bar with ice maker ensures your guests are refreshed. A transom door gives access to the expansive swim platform with faux teak finish, removable dinghy chocks, transom locker, and freshwater shower. The walk-through windshield gives easy access to the foredeck. Her Fastech hull is designed to provide secure ride on open water.The upscale salon has port side galley with Corian counter top, electric cooktop, and stainless steel sink. Appliances include built-in microwave oven and full size refrigerator/freezer. The forward v-berth/dinette provides a place to relax and dine during the day while converting to a double berth for overnight cruises. The mid-cabin provides a private double berth for additional accommodations. The enclosed head with shower is starboard. Reverse cycle HVAC maintains interior comfort.This 40' express is powered by twin 370-hp Volvo Penta D6 engines with DuoProp sterndrives. They have low hours and provide sportcruiser performance. A Westerbeke generator provides offshore electrical power. 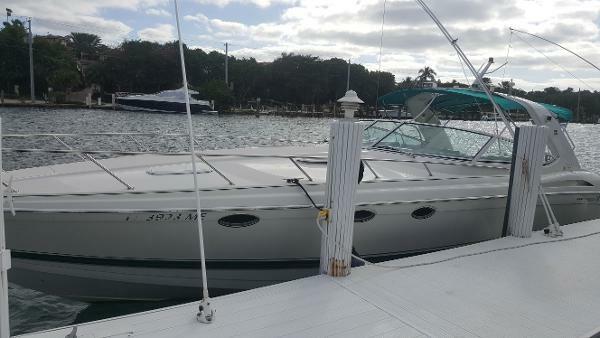 Well maintained with no bottom paint, this beauty is well equipped and is ready to cruise. 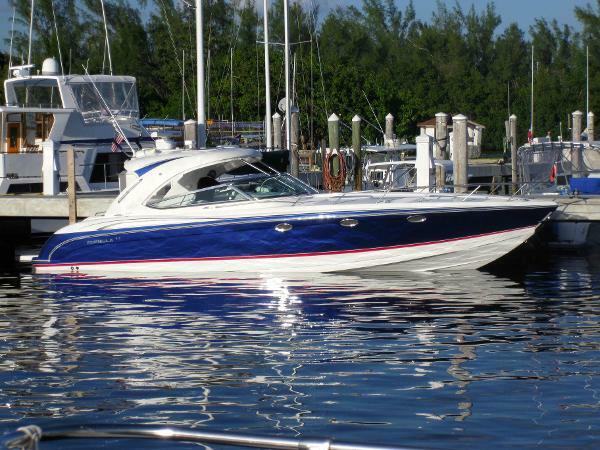 Call now for more information and to schedule a showing of this Formula 400 Super Sport.